Meal planning is a must to keep my family on budget and eating healthy. Fact: When I meal plan, I save money. Fact: When I meal plan, my family eats healthier. Fact: When I meal plan, I am less stressed. These are all facts. Another fact is, that weeks go by without meal planning in my house. I have tried bulletin boards, fancy schmacy planners, expensive books and more. They just don’t work for me. I need to keep it simple. I came across this one page meal planner by Rachel Ann, I decided I was going to give it a try. I love that it integrates the shopping list on the same page. It is simple, it only includes weekdays, but I think it might work for me! 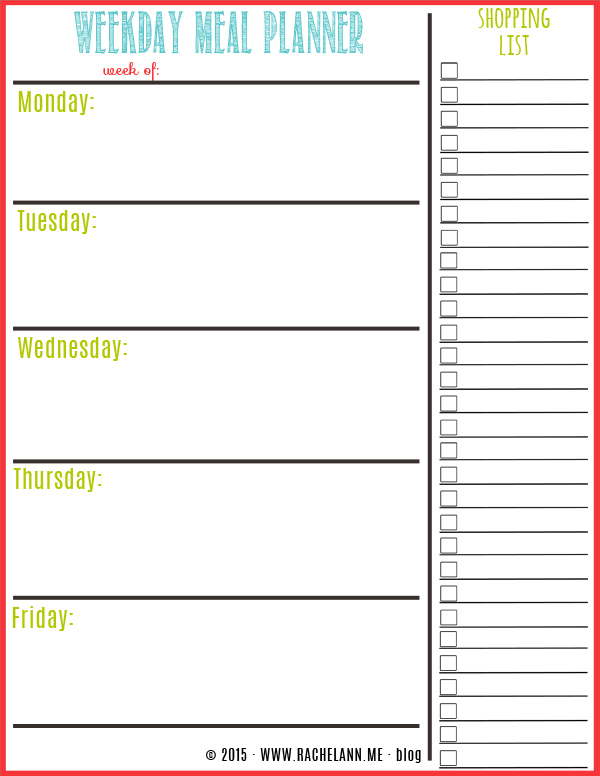 You can download this Free Weekday Meal Planner here. What tools do you use to meal plan? Share them in the comments! All I wanted to do was print one meal planner. I was even interested in getting emails from you, but now I’m having to download a bunch of garbage I don’t want on my computer and I have been fighting with this for half an hour. Forget it. Take me off of all your stuff please. I could have made my own by now.